Toshiba P50T 15.6" Touch Ultra HD 4K Laptop Core i7-4710HQ 16GB, 1TB HDD+8GB SSD. The Satellite P50t-B is ideal for visual creative professionals and multimedia enthusiasts. It offers outstanding levels of portable picture quality, delivering true-to-life image production alongside a premium mobile entertainment experience. With a 3840 x 2160 4k screen, the P50t-B features a 39.6cm (15.6-inch) Ultra HD display. 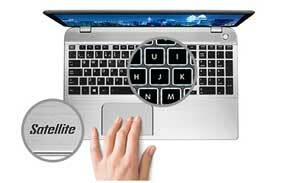 The Satellite P50t-B was built to take on the most intensive computing demands and turn heads at the same time. With a rare blend of power and beauty, the premium built P50t-B offers the ideal solution for strenuous multi-tasking, media creation and gaming. The 39.6 cm (15.6-inch) Satellite P50-B features a large Ultra HD 4K touch display, which delivers a 3840 x 2160 screen resolution at 282 pixels per inch. That's four times the pixels of Full HD for four times the clarity, so details are more noticeable and text is razor-sharp. There's more natural colour expression too, as the Ultra HD display is true-to-life colour calibrated by Chroma Tune and certified by Technicolor. In addition, every model comes with pre-installed Chroma Tune for Toshiba software, so you can select the best colour space for the content being viewed and software applications being used. The 4K display has been colour calibrated by Chroma Tune and certified by Technicolor -- making it the ideal tool for photographers. With 10-finger touchscreen support, you can interact with your applications and games more intuitively, using all of your fingers -- and get the most out of Windows 8.1 too. The touchscreen is naturally simple to use, and features anti-fingerprint coating, so smudges won't get in the way of your media as you scroll, drag, swipe or stretch images. With the Satellite P50-B, you can expect optimum power. The Intel Core i7 processor is Quad Core, so you know it's going to respond to your every command at speed. Plus, there's AMD Radeon R9 M265X enthusiast graphics with 2 GB GDDR5 VRAM inside, for a fast, yet smooth graphics performance -- even when playing demanding games, or running multiple applications. When you have this much power within easy reach, you're ready for anything. DTS Studio Sound has a number of features to help you get the best audio experience, including DTS TruVolume and DTS TruBass. Lose yourself in higher-quality audio that's music to your ears. With Harman Kardon stereo speakers and DTS Sound audio enhancement throughout every tune, movie and video. 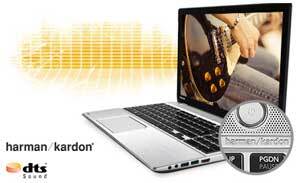 This leading combination of sound enhancement software with premium Harman Kardon speakers provides a listening experience that is more natural and detailed with distinctive dialogue and incredibly immersive surround sound. DTS Studio Sound is an advanced audio solution suite for all PC applications related to music, movies, streaming and games. Immersive surround with deep, rich bass and crystal clear dialog is delivered at maximum volume levels and without any fluctuations, clipping, or distortion. Speakers and technologies can be tuned for peak performance, and the user's provided with an intuitive interface providing presets for ease of use. Designed to look as good as it performs, The Satellite P50-B comes with an eye-catching brushed metal chassis. The fully-featured Satellite P50-B lets you do more with your media. You can connect your MP3 player and enjoy your tunes in enriched quality through the premium Harman Kardon stereo speakers. Even if the laptop is off, you can still sink into your favourite sounds using the Sleep-and-Music function. The design of the Satellite P50-B includes a brushed aluminium finish with chrome accents, and an illuminated frameless tile keyboard. The Satellite P50-B comes with a range of flexible connectivity options. 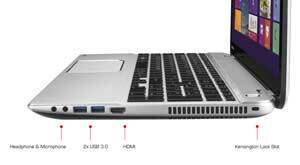 Just plug it into one of the four USB 3.0 ports to transfer data to and from your device at speed. One of these ports supports Sleep-and-Charge, so you can charge your USB device too, even while your laptop is in sleep mode. Plus, you're already set-up for your TV -- whether you want to experience lifelike definition on your 3D TV or discover the best image quality available on your Ultra HD capable TV -- all through a HDMI-out port that supports both formats. 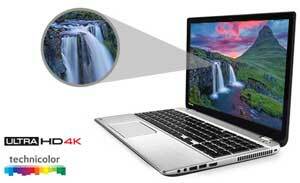 The Toshiba Satellite P50-B has an integrated HDMI port for added convenience and enhanced usability. You can connect your laptop to an external device and stream high definition content. When using HDMI, audio and visual content are streamed through a single cable, removing the need for multiple connections. You only need one cable, making connecting your laptop easier and tidier. 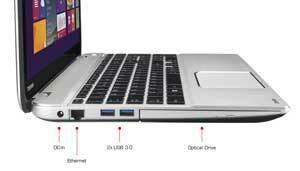 See some of the features of the Toshiba Satellite P50-B laptop. Thanks to HDMI technology, when connecting to a compatible display via a HDMI 1.4 cable, you'll be able to output the very best in 3D entertainment to the big screen. You'll even be able to experience the next generation of entertainment when pairing this laptop with 4K display. The integrated Intel Dual Band Wireless-AC 3160 supports the Wi-Fi AC standard, and takes home networking to another level of reliability, speed and coverage. Bluetooth allows your P50-B to communicate with other Bluetooth-enabled devices. There's Wireless Display technology too, so you can wirelessly stream all of the things you love -- including music, videos, photos and music -- directly to your big screen HD TV. Plus, there's Gigabit LAN for the freedom of fast access to your local network. The Satellite P50-B has a real sense of style -- and makes a statement before you've even switched it on. The smart silver body leaves a lasting impression, and features a brushed aluminium finish with chrome accents that reflect its premium quality. A frameless tile keyboard forms part of the distinctive design and, as it's illuminated, can be used in dimly lit conditions, the large, spacious click pad makes navigating around the screen much easier too. Incredibly stylish and user-friendly, you'll be happy to take this portable PC anywhere.